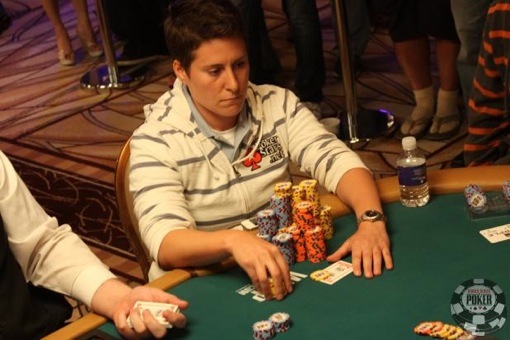 Vanessa Selbst is in contention to do what no woman has done since her. :: Event #2 ($1,500 NLH) – The field is down from 2,101 to 15. Jacob Bazeley is the big stack with 1,291,000. 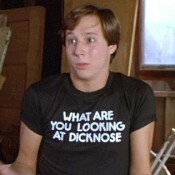 He’s followed by Ryan Schmidt with 1,193,000. In fourth is former bracelet winner JP Kelly with 721,000. Also alive in fifth overall is Vanessa Selbst, a woman who likes women, with 706,000. Vanessa Selbst is looking to become the first woman to win a bracelet since Vanessa Selbst did it in 2008. Phil Hellmuth went deep in this one, but was eliminated in 61st ($7,204). Get full chip counts here. :: Event #3 ($3,000 NLH/PLO Heads-Up) – A total of 317 entered this first-time event. Matches concluded with 64 remaining. Plenty of notables are still alive, including David Chiu, Justin Bonomo, Annette Obrestad, a woman, Josh Arieh, David Williams, [………. ], and of course, Ashkan Razavi. First place will pay $207,708. Get the full remaining field here. :: Event #4 ($1,500 7CS 8oB) – An impressive 622 entered the final event of the day, with 210 surviving. William Carroll is the chip leader, stacked at 49,100. He’s followed by Michael “The Grinder” Mizrachi with 41,500. Also alive, Phil Ivey with just over 10,000. Get full chip counts here. 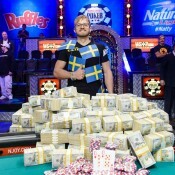 Get more WSOP recap info and photos from BLUFF here. 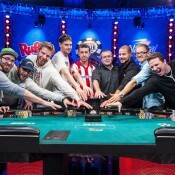 * Image courtesy of WSOP.com.